Last week, “06880” reported on the pending move of Achorn’s Pharmacy, from its longtime home on Main Street to Playhouse Square. Readers, naturally, commented on every angle, from the changing face of downtown to the tax rates in Vermont. But one set of voices was not heard: anyone associated with Achorn’s. Now, enjoy these insights from Alan Bravin, son of the store’s longtime owner, Murray Bravin. When I heard that Achorn’s Pharmacy was moving from Main Street, I wasn’t sure how I felt. At first it didn’t really sink in since I haven’t lived in town since 1977, and also since my dad sold the store in the early 1990s. But in the few days since I found out, I’ve reflected back on the years that Achorn’s was owned by the Bravin family. 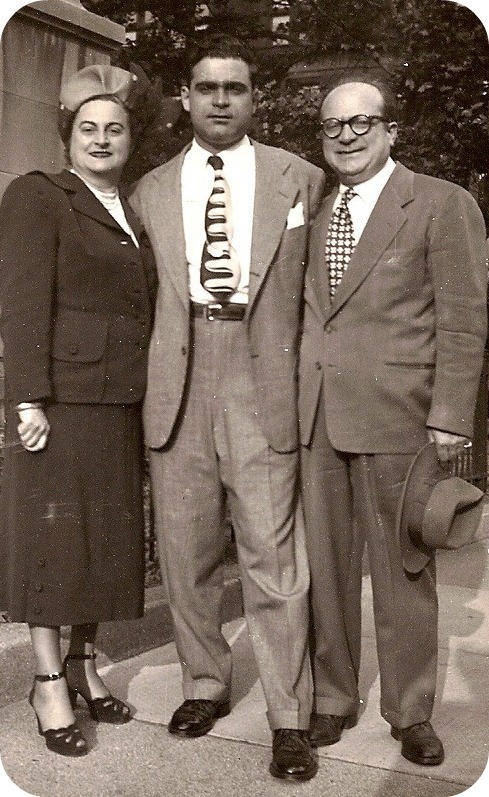 Murray Bravin (center), with his parents, Anne and Henry. I was 3 years old when we moved from Brooklyn to Westport, and into our home at 3 Silverbrook Road. I didn’t understand it at the time, but now I realize how lucky our family was. 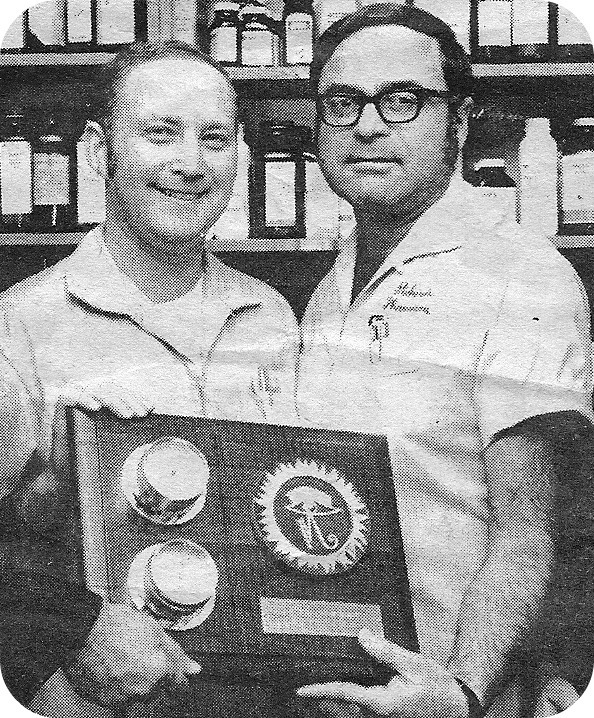 My dad Murray, along with his dad Henry, had bought Achorn’s Pharmacy in 1956. As I grew up, I’m not sure I fully appreciated how great a place Main Street was. Next door was Gristede’s; across the street was the Remarkable Book Shop, Westport Pizzeria and Osca’rs, and down the street was Klein’s and the YMCA, where I spent many days playing billiards, badminton and basketball. At the end of Main Street at the Post Road was Ships, which to this day made the best seafood bisque I’ve ever had. It seemed everyone knew everyone. Main Street was indeed a community of its own. I remember getting Hanukah/Christmas gifts from the store — simple things like Scotch tape, staples, gold chocolate coins, etc. I was happy to have them all. Imagine giving kids gifts like that today, instead of an iPhone or iPad or Xbox or Wii. The world sure has changed. And so has Main Street. I did many things at Achorn’s when I was old enough. Anything from stock boy to delivery boy, cleaning up, running over to Oscar’s to pick up lunch for everyone, or working behind the counter processing credit cards the old fashioned way (running them through a machine to make an imprint of the credit card). Murray Bravin, behind the Achorn's counter. 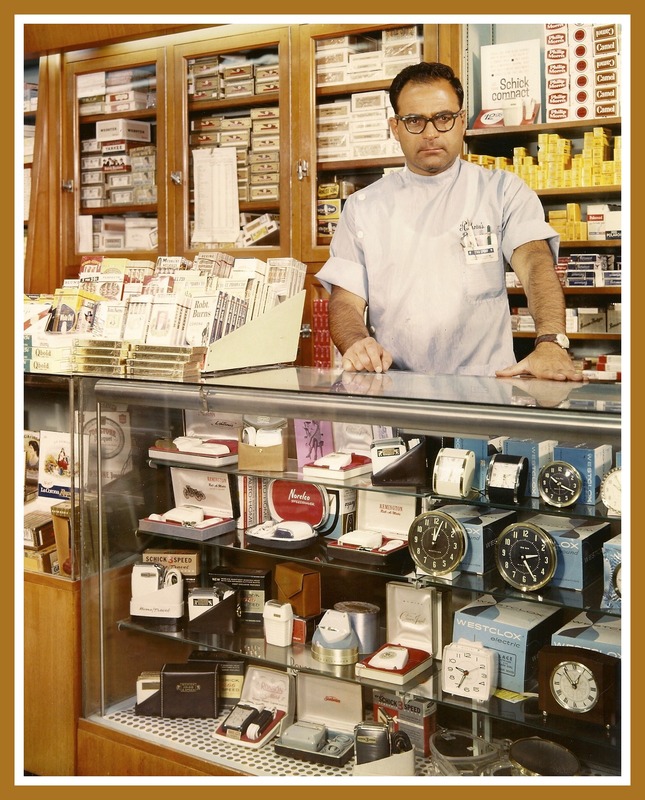 Big sellers at the store were cigarettes, cigars, Timex watches and camera film. I imagine they aren’t such big sellers today. I remember meeting Paul Newman, who came into the store one day when I was there. But I mostly remember my hero, my dad Murray Bravin. In the nearly 4 years since my dad’s passing, I’ve run into several people who knew and admired him. The time that affected me the most was when I played golf a few years ago in Southern California. I went by myself, and was paired up with an older man I had never met. He said they had lunch on several occasions, and how much they liked each other. The rest of the golf round was fantastic conversation. No one admired my dad more than me. He was kind and a very generous man. The stories I’ve heard make me feel even more proud to be his son. I don’t think it was random that I ended up on the Apaches Little League team that was proudly sponsored by Achorn’s Pharmacy. I saw Pamela Sue Martin at our 10-year Staples reunion in 1981. Pamela worked at Achorn’s when she was at Staples. I asked if she was interested in getting her old job back behind the counter. She just smiled. She already had a day job that was paying her sufficiently. Something to do with playing Fallon, a regular character on “Dynasty” at the time. I doubt minimum wage (or slightly above) could compete with that. I think back on the day that Achorn’s entered the computer world for inventory and re-ordering. Dad resisted the effort, but was finally convinced to convert. After a rough transition period, it made his life so much easier. I remember the long hours my dad put in at Achorn’s, standing on his feet all day waiting on customers, filling prescriptions and listening to their stories, checking inventory, cleaning up. Making emergency free deliveries in the middle of the night to get people prescriptions they needed right away. He loved all of it. I’m glad that Achorn’s is moving from Main Street. For me personally, it will never be the same as it once was. It is the end of an era. This entry was posted in Downtown, Local business, Looking back, People and tagged Achorn's Pharmacy, Alan Bravin, Murray Bravin, Pamela Sue Martin. Bookmark the permalink. Your words do your Dad such an honor!! Remembering our Marauder Day’s he was always there, cheering you on and cheering us all on!! He always had such a warm smile when we went into the store as kids, especially if we were on the Marauders!! Hmmmm, how many packs of baseball cards did I buy at Acorn’s?? Oh my that was a lifetime ago!! Alan, great to hear from you!! You are right!! Our Main Street is not there any more!! Ben Franklin, Greenberg’s, Welch’s Hardware, The Little Shop, and Thompsons Drug Store and of course Bill’s Smoke Shop!! I think *I* even bought baseball cards at Achorns, Tom. Remember Mr. Renzulli? The pharmacy counter was on the wall to the right and it was all trimmed out in Wood. Or was it the left? That was the expensive part of town, with Peck and Peck (?) next door when I was a kid. As you can see my memories of Achorns before Murray were sketchy. But I tear up thinking about Murray, however. He was part of my support system and a very dear friend. I came to realize that he knew a tremendous amount about medicine and he helped empower me. He was always kind and never dismissive and spent a lot of time answering questions. Casey’s been great too. I didn’t comment or even read the comments from the first Achorns post because I thought I read it was closing for good. I was devastated. Whew. Big Al–what a wonderful tribute to your dad. Obviously I’m biased since I lived next door to the Bravins, but I can affirm what a terrific guy Murray was. And he loved living in Westport and being part of the community. I worked at Achorn’s Pharmacy every day after school when I was in high school. 1972-74. It was a great place to work. I even got my mom, Chris Rogers, a job there as the bookkeeper. The gentleman pictured above with Murray and the plaque, was Bill Goldstein. They were both wonderful guys! 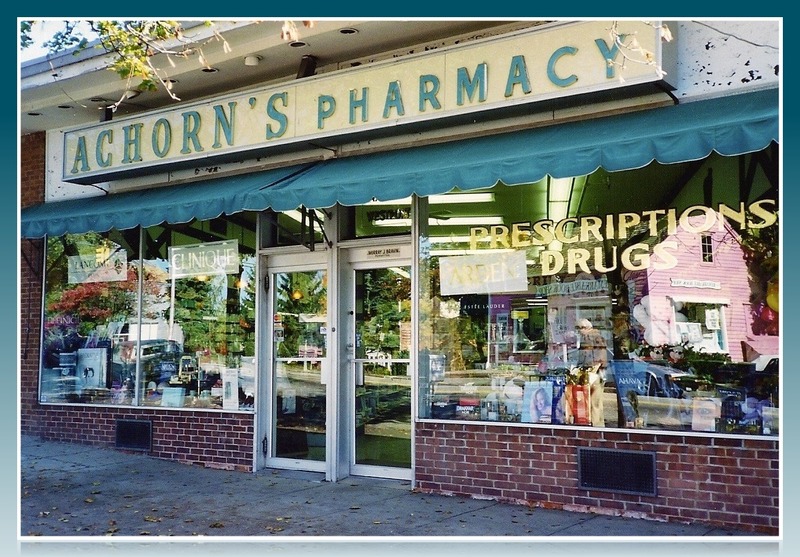 I’m sad that Achorn’s is moving, because now, when I walk past it, I remember my mom sitting upstairs in the little office overlooking the pharmacy. There was a Mrs. Achorn? Really? I don’t know why that surprises me. I was just in there today picking up a prescription. Yeah. And remember her little one? You should see him now. He’s grown into a big, sturdy oak. Thanks Alan for sending me this beautiful memorial! It is wonderful to read about cousins that meant so much to so many people and what a good friend he was and father to you and your brother. Alan, I hear such love and admiration in your tribute to the store and your Dad. I know your Dad would be so very pleased to hear your memories and to know that he has left such a kind and thoughtful son. Thank you for sharing your recollections and for your straight forward word crafting that captivated my interest. You made me feel like I knew your Dad, and I sure wish I did. Cheers, Murray! I also have wonderful memories of the pharmacy. Alan I can remember so clearly the weekends we spent with you, Cliff, and your parents. The highlight for me was going to the pharmacy. Murray would open the store for us, and I got to choose something. I always choose the scented powder with a puff. About 3 years ago we were in Stamford, and I requested we drive to Main St in Westport so I could see the pharmacy. It was wonderful, I took some pictures for my parents to see. Your Dad was always one of my favorite people. Wow! The way somethings happen. I wouldn’t have never seen this article if I hadn’t have 1. downloaded season 1 of Dynasty; 2. watch Pamela Sue Martin (Fallon) hit that nice billiard shot; 3. then googled: pamela sue martin plays pool. The thing about this is, this article was posted last month. I first watched Dynasty in 1981! Is this the Al Bravin that went to UT Austin in ’71-’73 or there abouts. He roomed with Pat Sullivan? Hi Neal. it is indeed the same Al Bravin who roomed with Golden Gloves champ Pat. Your backpack is a funny story….I don’t remember doing that, but it sounds like something I would do. If by chance you see this, is there a contact # or email for you or Pat. What is the name of his store? I hope you and Pat are doing well. Thanks for posting this story. My name is Rich Strickland and I grew up in Fairfield. I lived right behind Bill Goldstein. One of my first jobs was the Achorn’s delivery boy. Drove a red dodge with the mortar and pestle on top. I worked there for several years, driving and working behind the counter. I worked there from about 1974 through 1978. Your dad was a great man, always provided very sound counsel to me and always made sure I had a few bucks in my pocket even if it wasn’t pay day. And he told me to get a haircut a few times too! Lol. My dad was not a big fan of long hair. And if you saw the pics of my brother and I in the early 70’s, you would know how hard it must have been for him. Thanks for posting your comments.